This week, Research Radio checks in with associate professor of nonprofit management Nidhi Srinivas about how interpreting the past helps us imagine the future. Click on the player below to listen to the podcast. Photo by Kasia Broussalian/New School. Nidhi Srinivas looks at history differently. As an associate professor of nonprofit management at the Milano School of International Affairs, Management, and Urban Policy, he focuses on methods of organizing and management from a historical perspective. Srinivas sees the past as up for grabs, which means that commonly accepted narratives should be re-examined. The idea is to look backward in order to move forward. In The New School’s latest Research Radio podcast, “Rethinking Occupy,” Srinivas examines the Occupy Wall Street movement through this unconventional lens. He posits that organizations can look at past failed management strategies to modify their current strategies and structure. Using this framework, Srinivas argues against the notion that an MBA offers the best management skills for every situation, and advocates instead for using historical analysis to guide management. Srinivas’ own involvement in the Occupy movement provided ample opportunity for study of what he calls “alternative paths in history.” Although he was excited at first about the movement’s philosophy, he is critical of its lack of clear mission and defined objectives. 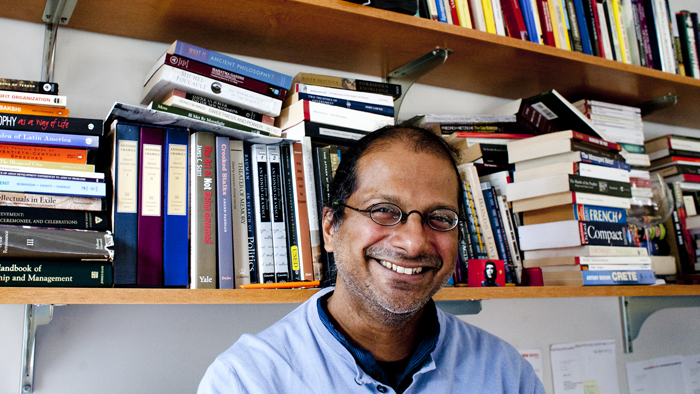 Srinivas’ advice for remaining members of Occupy: Seek out historical models, such as the organizational practices of the Quakers, and establish realistic goals. Histories aren’t the only type of books Srinivas recommends to his students. “In a lot of ways, our history has imitated science fiction,” says Srinivas. “The best thing we can do for ourselves is to learn how to think differently, reflect upon history so we can be critical, and in the end, emancipate ourselves from preconceptions.” What sci-fi novel does Srinivas recommend? He’s quick to respond with a resounding endorsement of “Do Androids Dream of Electric Sheep?” the basis for the film Blade Runner. As a podcast series that details the university’s stories of academic inquiry, Research Radio is a window onto the varied research interests of the New School academic community. Just before the election, the New_s previewed Research Radio with a story on the partisan political divide. After a few tweaks, we’re now introducing Research Radio’s permanent home, including fresh new episodes and posts. In each podcast, host Kasia Broussalian interviews professors and students about their research—there are stories about a little-known Baroque composer, the city’s progress in an extensive tree-planting project, and the rather gloomy views of the United States’ democratic process of a politician-turned-academic. The Research Radio staff is looking for suggestions, topic proposals, and recommendations from faculty and students for guests on the podcast. We look forward to hearing from you! Research Radio is a New School podcast series that tells stories of academic inquiry at the university. From sustainability to psychology to politics, our faculty and students have been researching pressing social and scientific issues for nearly a century–and now you can listen to their latest findings. Subscribe to the podcast on iTunes.